It’s time! To infuse your booze. No really. It is. You needed to do this, like, five minutes ago, if you want to have it ready for the holidays! I know. Don’t hate me. I’m not listening to Christmas music or anything. But I must tell you about this deliciousness NOW so you can reap the benefits in six-ish weeks. You will thank me, I swear. Vanilla Apple Pie Bourbon. There, I said it. Do it with some apples (um, obviously), cinnamon sticks and vanilla bean. It smells like freaking heaven and I sort of wanted to plunk a straw right now into this jar. Not a good idea. Not good. Or. Chocolate Orange Bourbon works too. I’ll be honest: I’m not a huge orange or citrus fan when it comes to chocolate. I’ve only ever tasted one of those chocolate oranges once in my life and it was when I randomly bought one at CVS ten years ago because I was curious. Not into it. I’d rather have my chocolate taste like peanut butter. But when we’re speaking in liquor language, a little brightness is okay with me. Cacao nibs and orange peel makes this taste like a dream. And maybe my personal favorite, if only because I’m predictably overusing it at the moment: Vanilla Chai! I threw a few chai tea bags along with the split vanilla beans into the jar to make this all super spiced and warming and fantastic. Even though it is chai, it sort or reminds me of gingerbread. I want to sip it over a large block of ice in a frosty glass and sit by a fire and read a book for six hours straight. Doesn’t that sound like perfection? I can’t wait for it to happen in 18 years. This technically wasn’t my first time infusing crazy amounts of liquor. Remember a few years ago when I made homemade cocktail bitters?! That was a PROCESS. With delicious results. And it was super fun too. This is kind of like that! Except not as crazy and time-consuming. There is one thing you need though. And it’s the worst possible thing to need. Ever. Ugh, why. Why why why does this take a few days or even a few weeks? The longer you let the fruit and flavors soak, the more flavorful the bourbon becomes. But I would suggest tasting it every few days or so, just to get an idea of what you’re liking, are you liking it, is there too much orange/cinnamon/vanilla/etc. Like make yourself a little cocktail to try it out. It can be your new job. Infused bourbon tasting. Twist your arm, right? 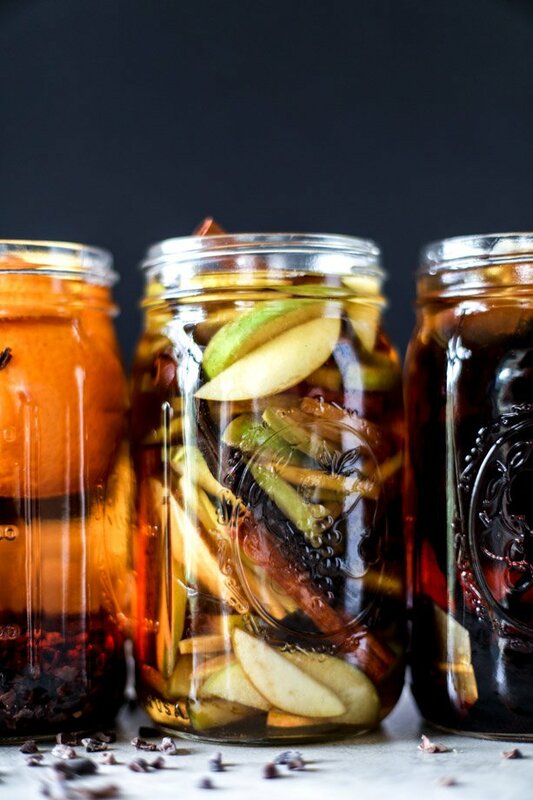 To make each infusion, add the ingredients to the bottom of a jar and pour the bourbon over top. Seal the jar (just with a regular lid!) and set in a cool place (preferably somewhere dark) for 2 weeks. I often stick mine in the fridge, just in case – but as long as it’s sealed tightly and not opened often, it will be fine. After 2 weeks, taste the bourbon and adjust the flavor accordingly. You can remove the cinnamon sticks or add more vanilla. If you’d like more flavor, infuse for another week and taste! If it tastes good to you after 2 weeks, strain the bourbon a few times. Place in a tightly sealed jar. For the vanilla chai flavor, if you’re infusing longer than a week or so, I’d use a loose chai tea and simply add it to the bourbon or open up the bag and add it to the bourbon. When ready to package, strain the bourbon into a pretty bottle or glass and label it! The make things like delicious old fashioneds. I not-so-secretly just want to eat those apples now. These look amazing, and great for Autumn. I must try using a darker spirit (spicing my own rum?) as usually I just go for clear spirits and home grown fruit – sloe and damson gin are big for my family (http://www.rachelphipps.com/2014/09/recipe-how-to-make-damson-and-sloe-gin.html) – nothing beats a good, Autumnal Sloe G&T after work! love that rachel! sounds delish. I’m using it now and it’s awesome! I’ve signed up for my account and have been bringing in fat paychecks. For real, my first week I made $306 and the second week I doubled it and then it kinda snowballed to $120 a day! just folloow the course…. You’re speaking my love language, Jessica! 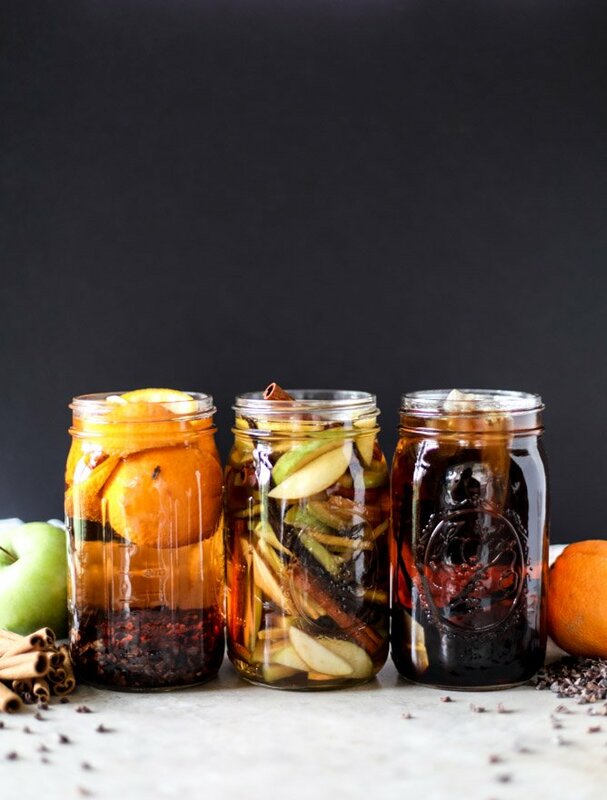 What bourbon do you use for the infusing? I drink bourbon and brown spirits regularly but typically higher end brands…which I don’t think is the best use for infusing. Thanks! yes! so i ended up using jim beam to infuse. my drinking favorites are bulleit, knob creek small batch, local wigle whiskey… but i like them so much on their own! from making the bitters a few years ago, i knew i could use a cheaper bourbon! I would also like to know what Bourbon you used, as I am also a high end, small batch bourbon drinker. hi brenda! so i ended up using jim beam to infuse. my regular drinking favorites are bulleit, knob creek small batch, local wigle whiskey… but i like them so much on their own and have heard it’s not worth it to infuse a “good” liquor! from making the bitters a few years ago, i knew i could use a cheaper bourbon! These drinks look soo amazing. I especially look forward to the apple pie version! Yes to knowing the type of bourbon too! Also I know I’m tired but it looks like you used either peels or whole oranges? Do we use the peels or the actual orange pieces (or both?). I’m all about doing this with blood oranges. hi sara! so i ended up using jim beam to infuse. my regular drinking favorites are bulleit, knob creek small batch, local wigle whiskey… but i like them so much on their own and have heard it’s not worth it to infuse a “good” liquor! from making the bitters a few years ago, i knew i could use a cheaper bourbon! and i used the orange peels (although i can’t peel them to save my life, haha) – not sure if you can use the actual orange slices? Thank you so much!! And you’re right – Bulleit and Knob Creek are too delicious on their own! I’ve made a number of spiced whiskeys and use full orange slices with no problem at all. When I use peel I just a vegetable peeler to it. Hopefully not taking too much of the white pith as it can be bitter. These look awesome and will be trying them soon! hi! great question and i should have clarified – if you like the flavor at that point, i guess technically you can strain it then! if you want the flavor to be a little deeper (maybe more cinnamony, for example), you could leave it soaking again. i’ve heard that prime soaking time is 6 weeks! Hi. I noticed that after the 2 week a good amount of the bourbon is “gone” as if the oranges soaked it all up. Is that correct? Should I squeeze the oranges after? And do I leave it in to infuse for 2 weeks or 6? I see different notes on that. Ooh I love these! The idea of waiting doesn’t sound so bad when I consider that I could make these now and be all set for Christmas presents for friends! right?! that’s what i’m loving about it! I wish I’d done this five minutes ago. I’m doing it *tomorrow*. Maybe some whiskey too!! Love this sooo much! If given as a Christmas present, how long can they save them to drink? Will the flavor change? hi! 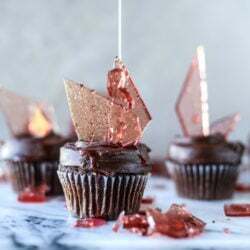 you strain the ingredients out before giving, so the flavor won’t change! it should be good for a few months! I’m using it now and it’s awesome! I’ve signed up for my account and have been bringing in fat paychecks. For real, my first week I made $302 and the second week I doubled it and then it kinda snowballed to $120 a day! juet follow the coursse..
Oh my goodness! I literally squealed while reading this!! Looks like all my friends will be getting bourbon this Christmas. ? These infused bourbons look so good, right there with you on all three counts, Chai would be my favorite. 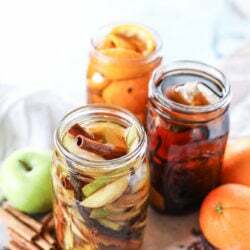 I have found infusions like this to be a real treat for family and friends as Christmas gifts. Last year I made cordials, Cherry of course, but my favorite – Blackberry, Blueberry, and Vanilla Bean Cordial. Limoncello and Cranberry Cordial also super easy and a special treat. I might have to expand my horizons and try your bourbons, they look to good to pass up. So I got your email… and 2min later had whipped up a batch of the Vanilla Chai since I had all the ingredients! Thanks! Can’t wait to try it. love these recipes but can I use whiskey instead of bourbon? Do I need to add additional sweetener to mixture to get the right taste.We also do our own Limoncello and vodka with cranberries and orange. mmmmm. Cannot wait to try them. Oh my. Guess I know what I am doing next weekend. 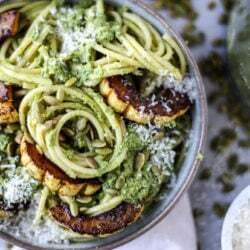 very cool recipes/post! super excited to try these over the holidays…my dad loves him some bourbon. From the day I started my online business, I earned 62 dollars every 15 minutes. I know it sound absolutely incredible, but you just cannot lose the possibility. Hi! Do you think vanilla bean paste would work? I’m having trouble finding vanilla beans for some reason. Amazon carries vanilla beans at great prices, and our Costco has beans now, too! All of these sound incredible and PERFECT for a fall old fashioned. This summer I infused rosemary into tequila for a tequila old fashioned and it was epic. Oh that sounds amazing! Can you share your formula please and thank you? I want to take these bourbon infused apples and make a bourbon apple pie! 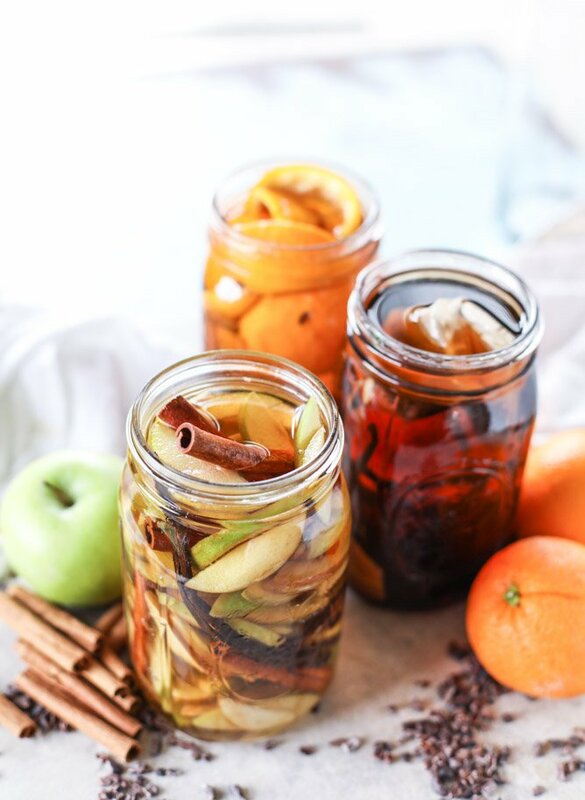 I’ve infused bourbon before, but these recipes look fantastic! Just made a batch of the Chocolate Orange Bourbon, so excited. Can you recommend a cocktail recipe or 2 using this? Yummy ! Bourbon :) would love to eat it ! This looks yum! Am going to try with some loquats, and wonder if the chai might be an interesting mix with that. Only one way to find out!!! How long can you keep the infisded strained bourbon?